Lock in a great price for Holiday Inn Express London - Watford Junction - rated 8.6 by recent guests. Easy access, Good arking rate £7 for 24hours. Lovely food and can take to your room for privacy if you wanted to.. I found the staff to be welcoming and very helpful. I also enjoyed the breakfast format. Staff were amazing in the desk very friendly, room ok nice and comfy. It was a great hotel, just what we needed. Staff were really friendly and helpful. The room was very clean and comfortable. The breakfast exceeded our expectations. The staff were friendly and helped us with requests. Staff very friendly and helpful. Close to the station so not far to travel with luggage. The beds were really comfortable and the rooms were all immaculate. Very clean. The breakfast selection was also great. It was quiet inside the hotel, did not hear any noise at all from the corridors or neighbouring rooms. One of our top picks in Watford.Just 20 minutes from Central London by train, this hotel just off the A412 has close connections to the M25 and M1 and is 2 minutes from Watford Junction Train Station. The hotel is a popular base for Wembley Stadium, which is 16 miles away. 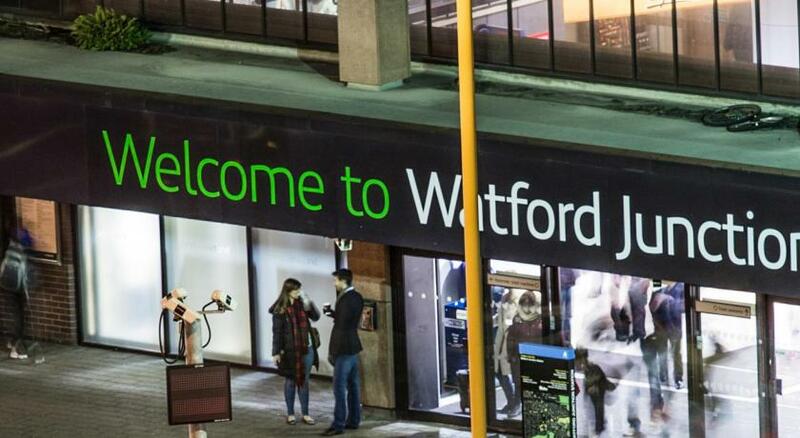 A direct train to Wembley from Watford Junction Train Station takes less than 25 minutes. The Holiday Inn Express London - Watford Junction is near Intu Watford Shopping Centre, and many corporate offices, including BT and Camelot. Warner Bros. Studio Tour of London is 2.6 miles away. Each morning, a breakfast of scrambled eggs, baked beans, bacon and sausages is offered. A lighter continental buffet is also available. Within the hotel are 2 conference rooms equipped with state-of-the-art meeting facilities and natural light. The bar lounge is open each day from 11:00 to 23:00. Holiday Inn Express London - Watford Junction has been welcoming Booking.com guests since 14 Jul 2009. When would you like to stay at Holiday Inn Express London - Watford Junction? This room offers either a double bed or 2 single beds. Bed configuration is subject to availability and cannot be guaranteed. Features include satellite TV, tea and coffee making facilities and en suite bathroom. Wi-Fi connection is also available for an extra cost. This comfortable, air-conditioned room features a flat-screen TV, tea/coffee facilities and en suite bathroom with power shower. Wi-Fi connection is also available for an extra cost. An en suite bathroom, a TV, and tea/coffee making facilities feature in this room with lowered bed. This accessible room offers en suite facilities with a wheelchair-accessible shower. House rules Holiday Inn Express London - Watford Junction takes special requests - add in the next step! Holiday Inn Express London - Watford Junction accepts these cards and reserves the right to temporarily hold an amount prior to arrival. Limited pay and display car parking available at the back of the hotel. Please park your car on one of the numbered spaces and collect a parking permit from reception. Additional spaces are available at the FLAG car park next to our car park. Breakfast was poor. Parking was terrible. No comment really as everything was just great for us.. The door closers were too strong resulting in banging doors. Breakfast juice was like water and beans were cold. Bedwear did have tears and rips in. The breakfast room was very busy when we arrived. Dirty crockery and cutlery wasn’t being removed from tables so it was impossible to get a table for some time, unless you were happy to clear a load of dirty crockery to somewhere else. The room was clean. Reception staff friendly. Not enough seating in dining room at breakfast. Excelent location, nice interior, fair pricing.